The future belongs to a different kind of person with a different kind of mind: artists, inventors, storytellers – creative and holistic ‘right-brain’ thinkers whose abilities mark the fault line between who gets ahead and who doesn’t. Captivating examples of this “different kind of mind” at work emerge seemingly one after the other. 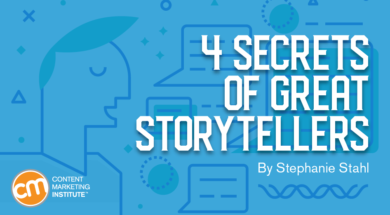 Let’s take a look at the secrets to their storytelling success. In his keynote presentation at Content Marketing World last year, Joseph Gordon-Levitt served as an in-person example of the “different kind of mind.” He’s an actor, a producer, a director, and a writer (phew!). His talk explored how thinking differently about creativity led him to form a new kind of collaborative production company. Anyone anywhere in the world can contribute to one of the company’s creative challenges by submitting (text, video, music, art) through the HITRECORD website. Ideas get remixed and refined by other contributors, and the best examples make their way into short films, online videos (some sponsored by brands), and other creative works. Want to see how to convert an undrivable vehicle to a pickup truck worthy of a tailgate in under 11 hours? Pull-A-Part has it covered through education and humor. Now that’s expertise and edge. The series, three years in the making, required executive buy-in, influencer relationship building, and content co-creation. But the result was worth the effort. In January, virtual reality debuted at the Sundance Film Festival, where Oculus Story Studio showed several VR shorts. These movies both represent and require different ways of thinking about story delivery and experience. A few brands took advantage of the 2018 Olympic Games in Pyeongchang to experiment with VR to engage a broader audience. NBC and Intel partnered to show 30 events in VR through headsets, smartphone apps, or 360 video. Meanwhile, The New York Times created an augmented reality section for Olympic features. These examples (and VR experiments emerging in fashion, cosmetics, comics, publishing, and the list goes on) mark the early days of this exciting medium for storytelling. Despite new options, the fundamental elements of powerful stories remain the same, Denise Roberts McKee, COO, About Face Media Inc., reminds us. Whatever the medium – fireside ballad, printed page, documentary film, or VR experience – the power of the story determines whether an audience will applaud the content or click away too soon. Maybe it’s a relatable hero, a clear goal, the passion and grit to overcome obstacles, or a meaningful resolution; the formula matters. The heart of content marketing is the ability to tell compelling stories that attract (and retain) an audience. The most successful brands, agencies, and media properties will be those that continue to tell great ones and adapt to new ways of doing it. I started this piece with one question: What’s your story? I’ll end it with another: How will you tell it?